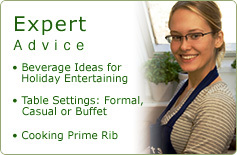 Let RecipeTips.com be your guide for great holiday entertaining. 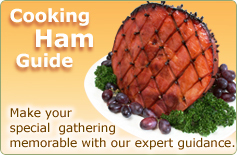 We’re your one-stop headquarters for everything you’ll need to celebrate the Holidays in style. Are you still wondering what to serve for a special Christmas meal? 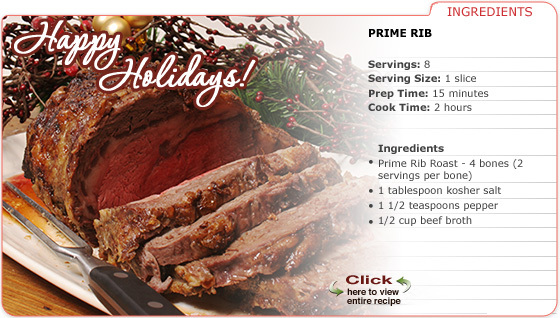 Why not prepare a tender, succulent prime rib roast using Recipe Tips’ expert guidance. Serving prime rib to your holiday guests is one of those once-a-year luxuries that can make Christmas meals so memorable. And, before the meal, be sure to try some of our inventive holiday cocktails to get your celebration off to a great start. Cheers! Don't forget to check out our Seasonal Features & Tips!